For the Marshall Power Brake, see Power attenuator (guitar). Power brakes are a system of hydraulics used to slow down or stop most motor vehicles. It uses a combination of mechanical components to multiply the force applied to the brake pedal by the driver into enough force to actuate the brakes and stop a vehicle that can weigh several tons. The brake pedal is connected to the vacuum booster which is the first step of the force multiplication. The booster passes the force to the master cylinder, which applies a compressive force to a liquid (hydraulic or brake fluid) and forces it through the brake lines to the brake calipers. The liquid pushes the brake calipers, which in the case of disc brakes, push against the brake rotor causing friction that slows and eventually stops the rotation of the vehicles wheels. In drum brakes, pistons push two shoes against the brake drum accomplishing the sameeffect. The vacuum booster was invented in 1927 in order to provide a shorter stopping distance. Vacuum boosters provide brake assist for the driver by multiplying the force out of the booster creating more than the force that was used to push on the brake pedal. The booster works by pulling the air out of the booster chamber with a pump creating a low pressure system inside. When the driver steps on the brake pedal, the input rod on the booster is pushed in which lets atmospheric pressure into the booster. This, in turn, pushes the diaphragm toward the master cylinder. The master cylinder is located behind the driver’s side dashboard mounted on the vacuum booster. The pressure inside of the master cylinder is created by a primary and secondary piston. These are pushed by the output rod of the vacuum booster to compress fluid within its primary and secondary chambers (hydraulic pressure). The hydraulic pressure is translated through the brake lines to the brake calipers. When the brake fluid is pushed through the brake lines, the master cylinder chambers are replenished by the reservoir (attached to the top of the master cylinder). Often used in disc brakes, the brake calipers consists of one to two hollow aluminum or chrome-plated steel pistons (caliper pistons). Brake calipers are one of the most important parts of a vehicle and are essential for your car's ability to stop.The job of the caliper is to slow the car's wheels using the friction they create with metal disks (rotors). They work by taking the pressure given by the master cylinder to force the pistons against the rotor. The development and use of disc-type brakes began in England in the 1890s. The first caliper-type automobile disc brake was patented by Frederick William Lanchester in his Birmingham factory in 1902. In a disc-braking system the rotors are attached to the car's wheels and spin together. Another type of power brake installed in automobiles is called the drum brake. This type of brake, in general, will create some friction that will slow down the wheel. How this works is there is a brake cylinder that connects master cylinder to the drum brake via brake lines that transfer pressure from the master cylinder. When the driver pushes the brake pedal with his/her foot, the pistons inside the cylinder will activate. 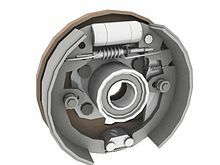 The activation of this piston will allow two brake shoes located within the drum of the brake to expand, thus generating friction to slow down and stop the wheel. Usually, this brake is located in the rear wheels of the vehicle, while the disk brake is located at the front of the vehicle. A car may also have only drum brakes or disc brakes both front and rear.